In 2016, it’s still cell phone cameras, not public reports, that give the public the closest view of the most contentious interactions between residents and law enforcement. Even after deadly shootings in many cities, and broader conversations about race and use of force by police, many agencies still give the public little information about how and when force is used in their communities. But in a major nod to transparency, the Pittsburgh Bureau of Police released a six-year analysis of force incidents reported by officers. The report, which is the first of its kind, looks at racial disparities, injuries to residents and officers and the various types of force used. Pittsburgh did not benevolently start keeping this data. A 1997 federal consent decree required the Bureau of Police to track every force incident to be reviewed by supervisors. That practice continued after the decree was lifted. Below are key findings that show how force is used locally and how Pittsburgh compares to other cities. While deadly force is mentioned, the majority of the report focuses on less drastic (and far more common) types of force. The review, which was requested by Chief Cameron McLay, covers incidents reported from Jan. 1, 2010, through Oct. 31, 2015. If force was used but not reported by officers, it doesn’t appear in the analysis. Charts are taken from the report. SRR refers to Subject Resistance Reports, which are forms officers are required to file after force incidents. 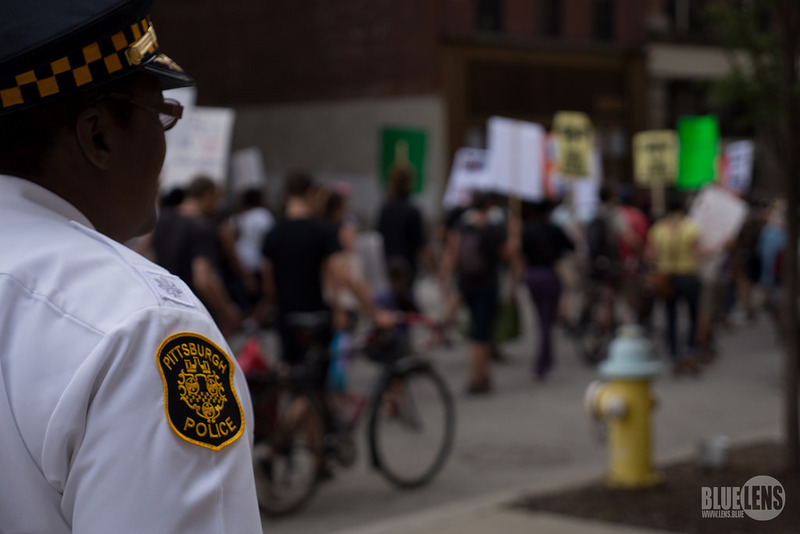 In Pittsburgh, force is disproportionately used against black residents. The city is one quarter black. But 57 percent of force incidents involved a black resident during the six years. 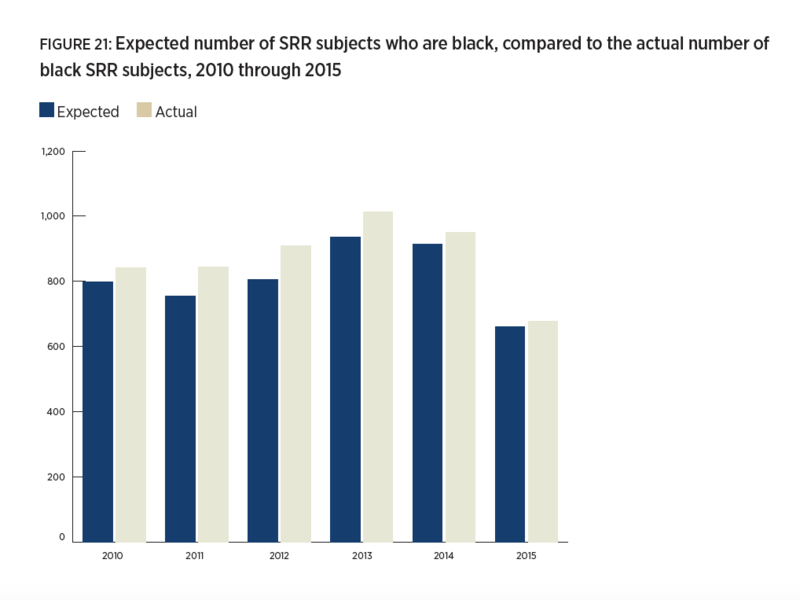 This is “higher than expected,” the report said, even after considering differences in arrest patterns by race. The disparity exists in every year, though it was less severe in 2014-2015. 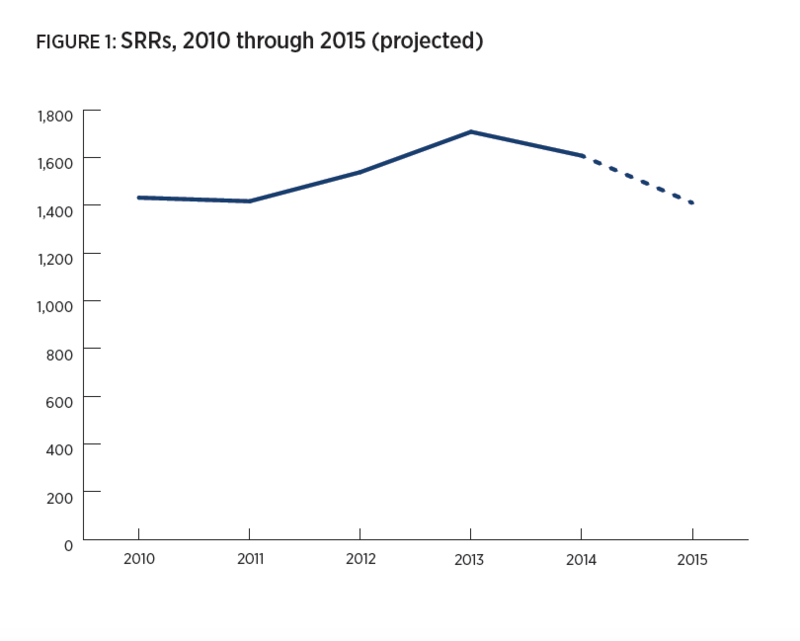 Force incidents are declining — but that’s recent. In 2013, the city peaked with 1,700 incidents (compared to the rest of the period). In 2014 and 2015, the average is around 1,500 incidents. The total number of arrests is down, too. 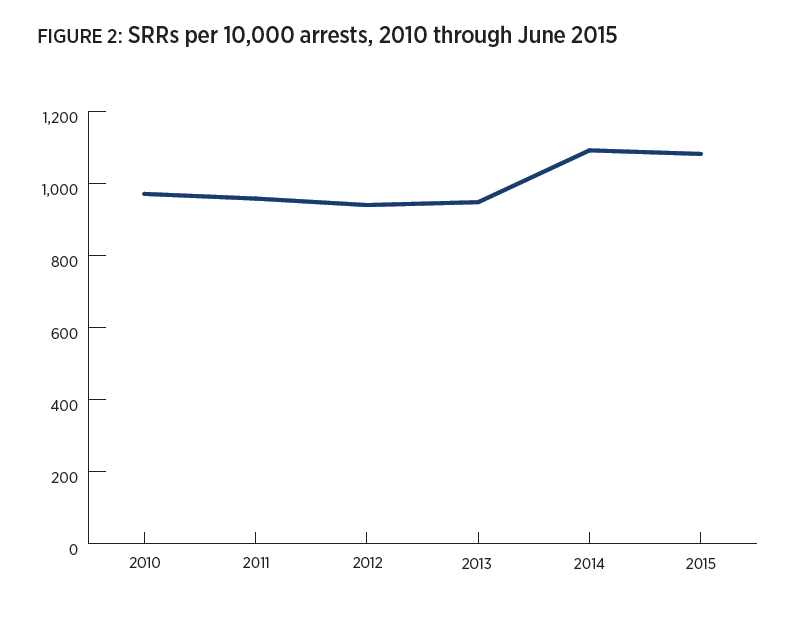 And because arrest totals dropped more drastically, more arrests involve force than in earlier years. Overall, one in 10 arrests involves force. 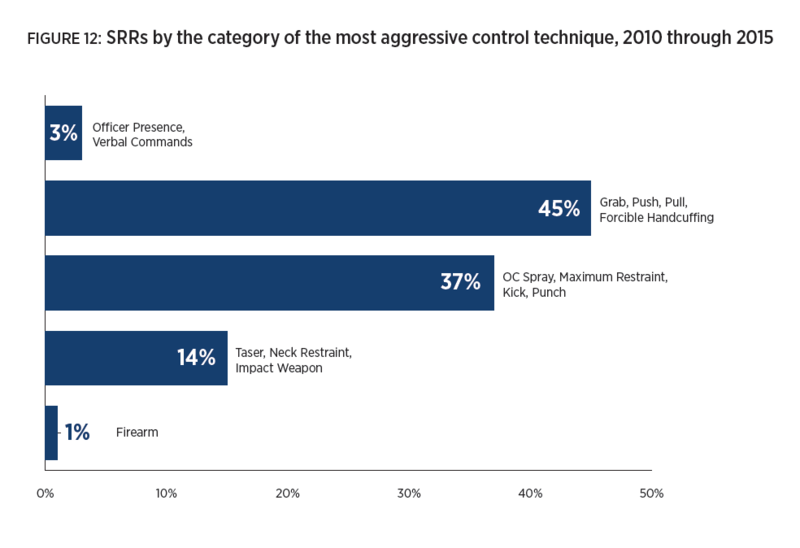 Using force – for most officers – is rare. Somewhere between one and five force incidents was typical for most officers during the six years. But for some, it happens over and over; 120 officers reported using force more than 25 times. That is more than five times the typical tally for most officers. Officers who use force more often are hurt less often. They hurt residents at higher rates. What does “force” actually mean? That can vary. The most common type is “forcible handcuffing,” though takedowns, punching and kicking and Tasers are also used, not to mention deadly force. Officers punched or kicked residents in about 10 percent of incidents. They used Tasers in about 6 percent of incidents. Over time, those techniques have become less common, compared to forcible handcuffing. Below is a breakdown of incidents based on the seriousness of the techniques. If you’re bar hopping on Carson Street, there’s a much higher likelihood you’ll see (or experience) a force incident. Police in Zone 3 routinely lead the department in use of force. The area also has a high number of arrests, but not at levels to explain the high numbers. But the report says the type of arrest may matter because the area has lots of bars and, therefore, lots of alcohol, leading to the type of “public order” offenses that police say may require more force. Are we better or worse? Overall, force incidents make up a sliver of all interactions the police have with residents. But how does Pittsburgh compare to other cities? We actually don’t know. Most cities don’t make this data public, and if they do, differences in definitions can make comparisons difficult. But a 2009 study of force by police in 12 U.S. cities gives some context. In Pittsburgh, residents are injured in a third of force incidents. In the 12 cities, that number is 39 percent. Officers were injured here in 10 percent of incidents, compared to 14 percent in other cities. Suspects here resisted in 47 percent of incidents. In the 12 cities, they resisted in 77 percent of incidents. While the report gives the most data to-date on use of force, there are also several questions the department can’t yet answer. Among those are: How are cases resolved in court? Why do reports of resistance differ for one race for specific types of crime? Are certain tactics more commonly used by police in certain zones? The report mentions several steps to ensure force is used properly, including crisis intervention and implicit bias training, as well as increased accountability when force is wrongly used.